The minister, in a debate ‘short-term discussion on the state of economy’ in the Rajya Sabha, said the coming generations will remember this government for creating a ‘new economic history’ of the country. Image Source : PTI Finance Minister Arun Jaitley in Rajya Sabha. File Photo. Finance Minister Arun Jaitley today assured that the positive impact of the economic measures being taken by the government would be seen in medium to long term. Members of Opposition parties, especially those from the Congress, attacked the government, saying unemployment is growing and all key economic parameters have witnessed a decline in the last three-and-a-half years. Countering the charges, the senior minister mentioned containing of inflation, recapitalisation of public sector banks and GST rollout as major policy initiatives of the Narendra Modi-led government. “All the steps we have taken, we have also paid price in the short term. But I want to tell you that in the medium and long term, these steps would be seen on the economy of the country and coming generations will remember that due to these steps a new economic history of the country has been written,” Jaitley said. On concerns being raised over GDP growth decline post-noteban, the minister said although the country’s economy grew at a rate of 7-8 per cent, people aspire for more. “The beauty of this country is and I consider it as a strength of this country is that at even a good 7-8 per cent growth rate, India is not a satisfied nation. We are not satisfied even if we are highest in the world, we aspire for more. That’s an aspirational India, it is a good sign,” Jaitley said. He further said that India is the only economy which could maintain a growth rate of 7-8 per cent in these challenging times. On steps being taken towards improving health of PSU lenders, Jaitley said the government is trying to revive the public sector banks by all means. “This bail-out which we are doing is not a very ideal situation but because public sector banks are property of the government, it is our legal as well as moral responsibility to keep them alive,” he said. So, the government is undertaking such a huge recapitalisation plan of over Rs 2.12 lakh crore, the finance minister added. “The idea is to keep the public sector banks alive so that the banks’ ability to support growth is not weakened,” Jaitley said. He further said the “reckless lending which happened” did not take care of risk management and adversely impacted the banks’ capability to support growth as well as impacted private investment. 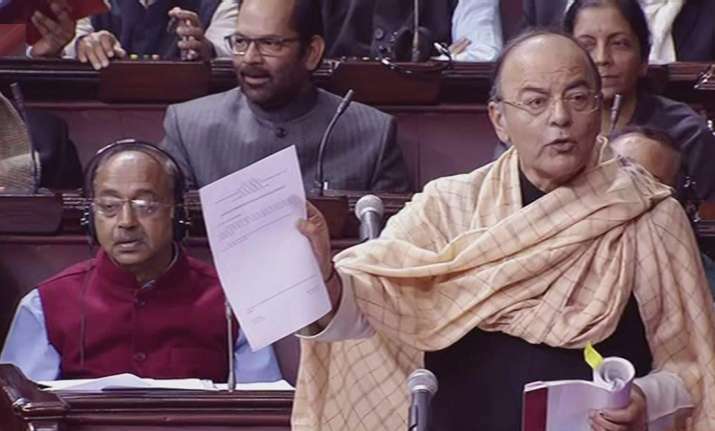 Rebutting Opposition’s charge that the Goods and Services Tax (GST) hit small-scale industries, Jaitley said the 1 per cent tax levied on businesses with Rs 1 crore turnover was the least across the world. Under the GST composition scheme, traders and manufacturers with a turnover of up to Rs 1.5 crore can pay tax at a nominal rate of 1 per cent. The turnover threshold was earlier Rs 1 crore which was in November hiked to Rs 1.5 crore. Around 16 lakh industries have registered under the composition scheme and paid Rs 250 crore in taxes, he added. On the infrastructure segment, Jaitley said the situation was so bad in the previous government that despite being a booming sector, there were no takers for tenders at that time. “Today 255 highways are under construction...around Rs 27,000-28,000 crore is going every year into the rural roads,” he said. Attacking the UPA government, Jaitley said: “You just remember the situation in which you have left the economy. You are talking about the new series of GDP. The new series of GDP was not implemented from 2014-15 but it’s from 2011-12.” He said the institution that measures GDP like CSO is part of the government but the political establishment maintains an arm’s length distance from such offices. Earlier, Deputy Leader of Opposition in the Rajya Sabha Anand Sharma asked Jaitley to release the GDP numbers of the last 10 years as per the old as well as the new series, to provide a comparison on the performance of the country’s economy during the tenure of both NDA as well as the UPA regimes. “In the last three-and-a-half years, we have seen a regular decline when it comes to all the parameters of the Indian economy. There is not even one engine of growth which is actually running,” Sharma added. He said the average growth of the GDP in the Congress-led UPA’s tenure was 7.8 per cent and the job creation was the highest in the manufacturing sector. “Today it is a very dismal situation... The average annual growth rate of the Indian exports was 17-20 per cent. Even if we take 17 per cent, it should be USD 480-500 billion. You cannot attribute the fall (in exports) to the global situation because trade has grown globally,” he said. The senior Congress leader also alleged that this government is not telling the country whether the four broad objectives of the government behind demonetisation were achieved or not, and how much black money was deposited in the banks. He claimed that world over, India has earned a bad name. Sharma claimed that things are going to be “very difficult” and there is bad news on the fiscal deficit and the current account deficit fronts. He alleged that the present scenario was such that the government’s critics were silenced whereas sycophants were rewarded, a claim which was protested by the Treasury benches. Referring to the government’s disinvestment plans, he called it a “grand clearance sale”. BJP’s Bhupender Yadav, Samajwadi Party’s Ram Gopal Yadav, TMC’s Sukhendu Sekhar Roy, BJD’s Anubhav Mohanty, JDU’s Harivansh, CPI-M’s T K Rangarajan also participated in the debate. Others who spoke were A Navaneethakrishnan of AIADMK, Veer Singh of BSP, Praful Patel of the NCP, Anil Desai of Shiv Sena, V Vijayasai Reddy of YSR Congress Party and Shadi Lal Batra of the Congress. D Raja of CPI said that agriculture is in deep crisis and farmers are committing suicide. “You are talking about doubling the farmers income an don the other side not increasing MSP to farmers,” he said. M V Rajeev Gowda of the Congress said the rate of employment generation has slowed down and industries such as textiles and leather, which provides good number of jobs have been impacted by demonetisation and GST roll out. Cattle slaughter rules have also devastated the leather industry, he added. Rajeev Shukla also participated in the debate.